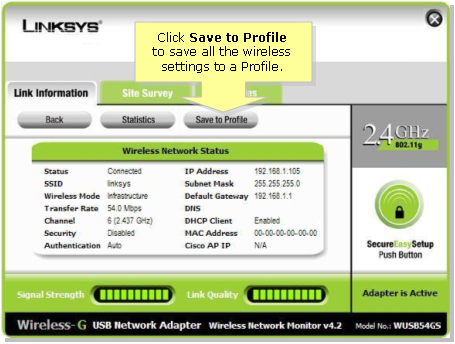 Before attempting to connect your Linksys Wireless adapter to a Linksys Wireless router, please know the following: SSID, Wireless Security and/or Network Key. If you do not know your wireless settings, click here for instructions on how to get your SSID, Wireless Security and/or Network Key. 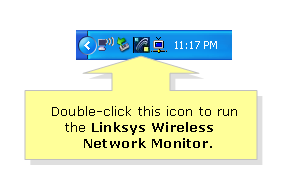 Run the Linksys Wireless Network Monitor by double-clicking this icon at the bottom-right corner of your screen. If you don’t see the Wireless Network Monitor icon, click here. 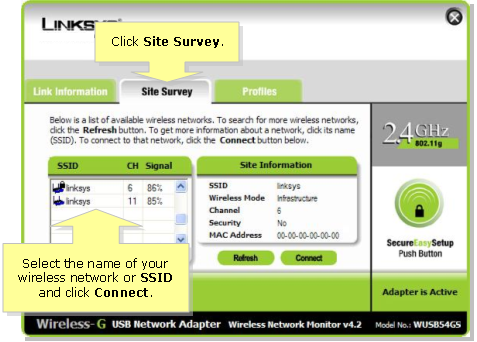 Click the Site Survey tab select the name of your wireless network or SSID and click Connect. 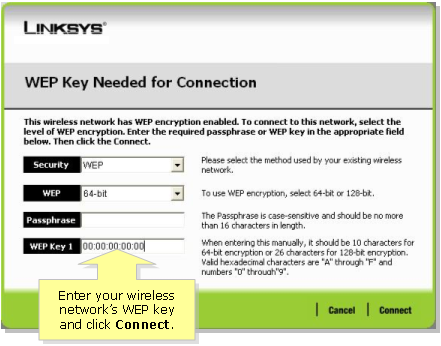 Enter your WEP key in the Key 1 field and click OK.
After getting a connection, the Wireless Network Monitor will bring you to Link Information. Click More Information. Click Save to Profile to save all your wireless settings to a profile. Note: If you’re unable to connect to your WEP-enabled network click here.